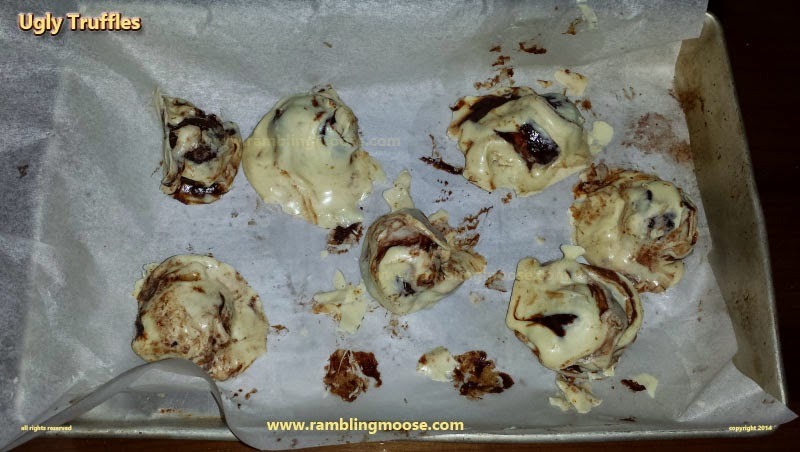 Rambling Moose: Ugly Truffles? Ship Them Anyway! I have a simple truffle recipe. Two ingredients. 1 cup heavy cream or whipping cream. Melt them together until smooth in a double boiler. Chill until firm, then scoop with a melon-baller. Trust me on this one, the "Melt them" step took 10 minutes from start to finish. The coating... it didn't go quite so well. I was showing off. I guess it helps to be put in your place. I guess I need to research this again. I wanted to use White Chocolate to make a dip. Thinking "how tough could it be?" I just poured some into the Bain Marie the next day and began melting. Florida's climate got in the way, I guess. The chocolate seized up and turned into a strange waxy grit. I searched for a solution and they suggested a little oil to push the water out of the mix. That loosened up the white goo into something smooth, but at a high temperature. While chocolate melts at 86F, White Chocolate directly out of the steam bath is considerably hotter. Truffles are barely solid at what passes for room temperature here, even on the coldest week of the year. Rolling the truffles into a little ball, then chilling them had helped a little bit, but they almost immediately started to melt as I tried to dip them in the white goo. Thinking "You're seeing things" I tried a second and a third. I stopped at 7. The rest got dusted in a premium cocoa and sent up North to my sister in Cherry Hill, NJ and my friend near Atlanta. Those were perfect. Actually, the White Chocolate Ugly Truffle Bombs were tasty. Misshapen bombs of sweetness with a thick uneven shell of white chocolate tasted great. They just looked ugly. *CRUNCH* Mmmmm you taste good. That is part of the holiday box thing I do. If I make a mistake, find something amusing to send along, add something memorable, I just toss it in the box and send it along. Amusing? I have a creative sense of humor. Tasty but amusing. In this case, just Ugly. I may as well Own Up to it, right? The solution is that there needs to be some fat added back to the coating to have them melt at a lower temperature. Your garden variety chocolate bar, melting at 86F, does so because there is an accepted percentage of fat added to the bar to help it melt at that point. The government here and in most countries say that in order for something to be called "Chocolate" there are proportions of everything. Otherwise it is merely "chocolatey" or "chocolate flavored". Lame imitation of the real food of the gods, you are banished to make Easter Bunnies, Gelt, and those weird coatings on discount branded snacky cakes that never quite taste right. Add more fat, like the cream in a truffle, they melt at a cooler temperature. Remove fat and you get something that eventually could become cocoa. During World War II through Gulf War I, Hershey made up some chocolate bars that melted at a higher temperature by changing the recipe to add egg whites as well as some other tricks. Living in Pennsylvania at the time, I found some of those "Desert Bars" at the Reading, PA Outlets and got a box or two. Interesting bars, they had a "harder" texture, but they were definitely what you and I would call chocolate. It tasted like your garden variety Hershey's Bar. These were better than what granddad had in WW II in their K and D Rations, but those earlier military chocolate bars were "better than eating a potato". I guess you had to be there for that one. So the next time I attempt White Chocolate dipped truffles, I'll add in some cream to lower that melt point so the mix doesn't have to be quite so hot. After all, the FDA doesn't even recognize "White Chocolate" as chocolate since there isn't any cocoa to be found in the stuff. It's just "sweet". A "confectionery". Great for coating things if you get your recipes right.